Construction can be a dangerous industry, especially if your workers aren’t properly trained. Unfortunately, given today’s labor shortage, we often have new crew members coming and going on our job-sites. Workers may claim to have general construction experience, but every job-site is unique and each task requires a special set of skills. Because you can never be certain what training a worker has previously received, the best practice is to assume all newly hired workers will benefit from a basic safety orientation. Before your new hire begins work, cover the safety basics. It’s up to you to create a culture of safety in your organization. Newly hired workers have always represented a higher percentage of total claims. At Builders Mutual, we have been tracking this trend for some time. From 2010 to 2013, 40% of all Builders Mutual reported employee injuries occurred within one year of their hire date. From 2013 to 2017, that number increased to 45%. That’s why Builders Mutual developed the WorkSafe program, a high-level guide to job-site safety, to assist contractors with new employee training. 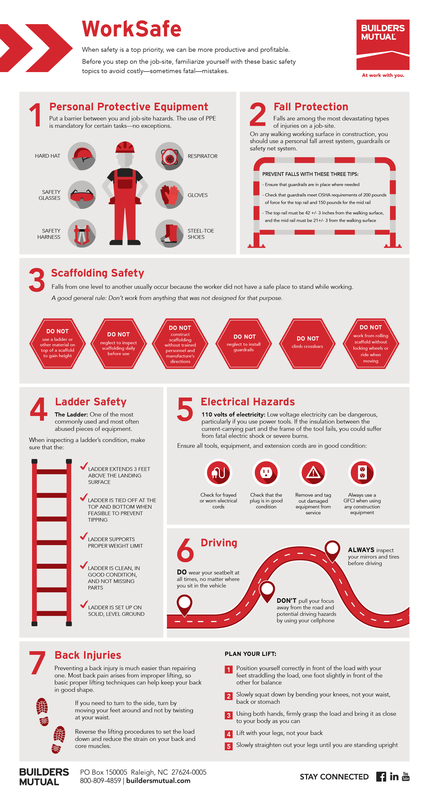 Below you will find an infographic that summarizes the basic safety topics covered in the WorkSafe Basics booklet. These topics were selected because they are the most important topics to learn the first day on a job-site and lack of training in these areas results in the most common types of claims. The topics include personal protective equipment, fall protection, ladder safety, scaffolding safety, electrical safety, defensive driving, and back safety and proper lifting. As a part of your orientation process, these basics should be reviewed with your new hires—regardless of their experience or the length of the project—before they ever set foot on your job-site. You should walk through this information section by section and field questions. This is also a great time to collect emergency contact information and discuss with them what happens if they are injured. Safety is everyone’s responsibility, and good safety practices benefit you, your team, and your company. When safety is a top priority, we can all be more productive and profitable—and you can ensure your team is healthy and able to perform at work. Use this tool to guide your crew’s actions on the job-site and contribute to a pool of properly trained workers.